Golden Triangle Tour – If you are traveling to India, and do not have much time to spare, you can have the gist of this heavenly country in just five days. Yes, opt for a golden triangle tour. Visit the capital of the country-Delhi, city of the monument of Love- Agra and a mute evidence of Rajput valor and chivalry- Jaipur. And all this can be enjoyed in just 5 Nights and 6 Days. After your arrival to Delhi, you will be assisted by our representative and will be transferred to the hotel. The morning will be spent in a majestic way by visiting some of the royal emblems of the country namely the Parliament House, President’s House, Parliament House, Government Secretariat Buildings including some of the cremation sites of some of our freedom fighters. The grandeur of the Mughal emperors can be relived by viewing the sky high monuments of the era like Qutab Minar and the Humayun’s Tomb. Your shopping spree will be best taken care of by the Chandni Chowk and connaught Place shopping areas some where in the afternoon. The eveninig will be spent in a religious way by visiting the most famous Lakshmi Narayan Temple; popularly known as Birla Mandir. Return to the hotel for an over night stay. A four hours drive form here will take you to Agra where you can see the eighth wonder of the World- The Taj mahal and rekindle the flame of your love for your beloved. Built by Shah Jehan in 1630, this eternal symbol of love enshrines the mortal remains of both the forer and his beloved empress Mumtaz Mahal. 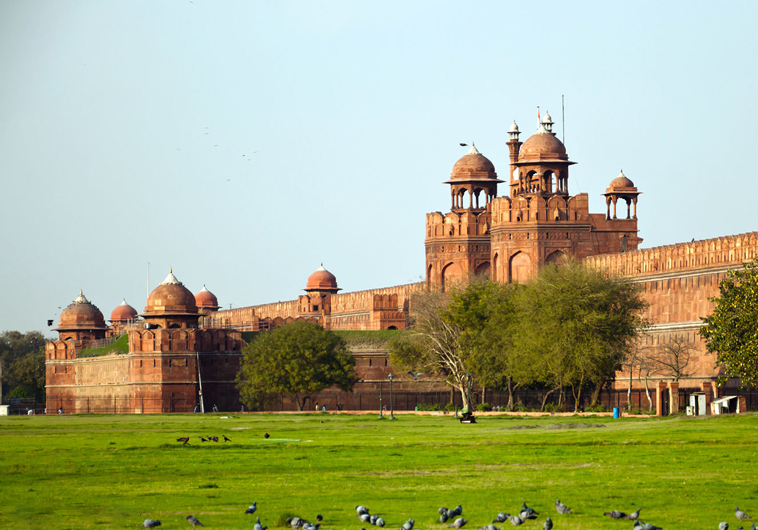 From here you will move to Agra Fort to view Pearl Mosque, the halls of Public and Private Audience. You will also visit the tomb of Itmad-ud-Daullah built by Empress Noorjehan in memory of her father will also be on your list. Return to the hotel in the evening for an overnight stay in this city of Love. Breakfast at the hotel and drive to Jaipur visiting Fatehpur Sikri also including the Jama Masjid, Tomb of Salim Chisti, Panch Mahal and other palaces en route. Check in at the hotel and get prepared for an afternoon tour of the pink city. On your visit to this 260 years old city, you will be first taken to the City Palace of Maharaja Jai Singh, the founder of the city. From here you will move on to the Observatory & Ram Niwas Gardens. From here, you will drive past Jal Mahal and Hawa Mahal through the pink rose residential and commercial areas. In the evening, you can pick your choose from the Johri Bazar and Bapu Market. As you are in the royal city, enliven the Princely grandeur by visiting Amber Fort on the back of an Elephant that will take you to the main entrance of the fort that served as the ancient capital of the State. From here you will be moved to Sheesh Mahal or the Hall of Victory scintillating with mirrors. The lunch can again be an extravagant affair at the ethnically built Chokhi Dhani resort. The evening can be leisurely enjoyed by watching the folk dances performed by the native artists. Visit the ancient temple of Lord Ganesha – the elephant headed god of Hindus and seek his blessings for your journey backwards. In the afternoon drive to Delhi and get transferred to the international airport to board flight for your onward journey.